14 reasons why you should use our brand new invati advanced 3-step system. Invati Advanced is manufactured with 100% wind power through renewable energy credits and carbon offsets. It reduces hair loss by a whole 53%. It smells amazing, thanks to a blend of certified organic turmeric, lavender and rosemary. Invati Advanced comes in small travel sizes, so it can tag along wherever you go. The Exfoliating Shampoo cleanses and renews the scalp with every shampoo. It’s 98% naturally-derived from flower and plant essences. You get the instant results you always wished for. 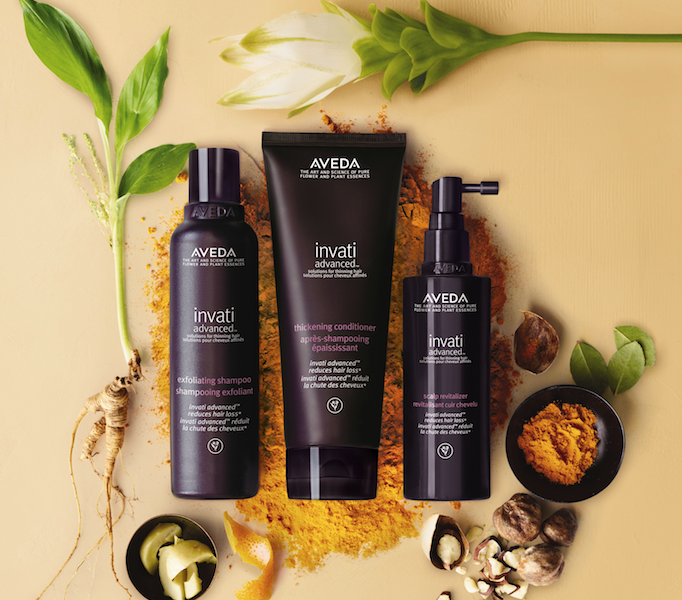 Invati Advanced instantly makes your hair feel and look thicker. The Thickening Conditioner weightlessly conditions your hair. The Scalp Revitalizer bottle is made from 100% post-consumer PET. The Exfoliating Shampoo contains wintergreen-derived salicylic acid, which helps remove buildup that can clog your scalp’s pores. It’s great for post-pregnancy hair thinning, so if you’ve experienced thinning hair after having a baby, give it a try. The new formula is color safe, so it won’t strip your color. Last but not least because every day should be a good hair day.